Aspiring to make a mark in the world of style here is the attire to breath life into your aspirations. 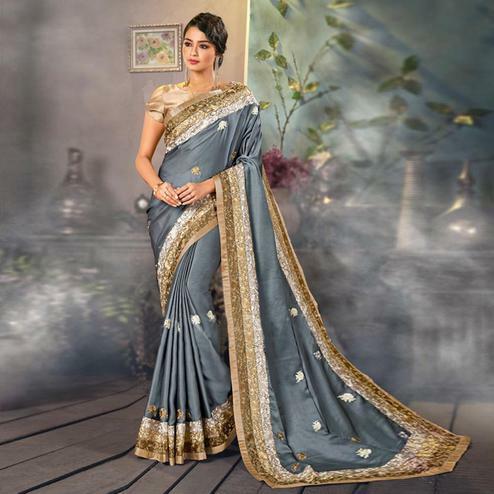 Add grace and charm for your appearance in this charming blue-beige designer saree. You could see some intriguing patterns done with embroidery work. This saree is made of chiffon accompanied with an unstitched chiffon blouse. Team it with stylised accessories to make your looks more beautiful. This attractive color saree would surely attract you showers of compliments when you wear it for parties functions or occasions. Buy this saree now as it's a unique piece with attractive color combination which is rare to find.